We are finally, FINALLY heading out on a beach vacation for the first time in like three years - to Fuerteventura! To the SUN! Can you tell how excited I am? Do you see the title of this blog? We finally booked it after I accepted a new position in Gent, which I'll start on the 3rd of July - the day after we get back. Let's hope I'm not looking like a lobster for the first day on the job. We're staying at an all-in resort hotel, which we've done before and liked, though I'm not sure how much time we'll actually be spending on the hotel grounds. There's so much to do on the island. This week, with PJ out of town, I've been getting ready for the trip and daydreaming (plus napping) about all the things we're going to do - sunning, surfing, and sampling all the tapas I can get my hands on. Which also means that I'm prepping my packing list with all the summer shopping I've been doing. To be honest, I started shopping before we even booked this trip. 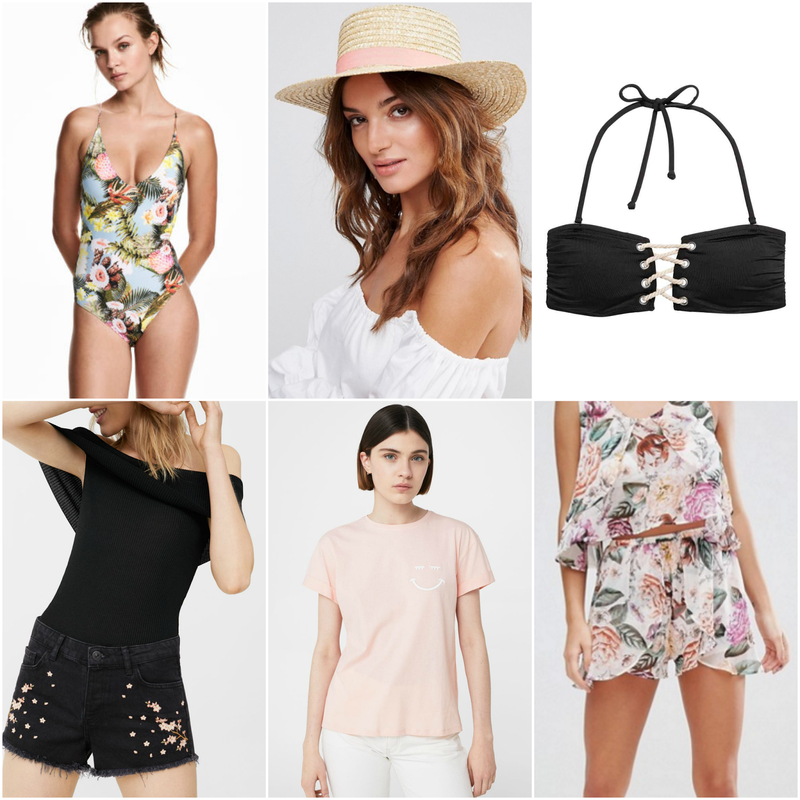 My absolute must haves for the week are shorts and swimsuits, though shorts are my summer staple no matter where we are. Add in a cute straw hat and some sunglasses and you basically have my wardrobe set for the week. This pink embroidered shirt is my everything right now. I didn't even need to try it on, I just knew - and Mango is killer for their tees right now - loving their graphic and slogan tees - I picked this one up a few weeks ago and have gotten so many compliments on it and the pink one above. The rest of my suitcase will include a few dresses from last year that I just haven't had the occasion to wear, plus lots of greens, whites, neutrals, and all the other swimsuits I can stuff into it. And some sunscreen. Don't forget the sunscreen. And with that, I'm off to get my nails done. I have a busy Thursday and Friday, with a new team dinner and workshop, then we head to the airport early Saturday. Only three more sleeps til I'm in paradise again with my love. Can't wait!